It's time to bring out the Blue Willow again! You all know I like it so much and use it with every holiday. 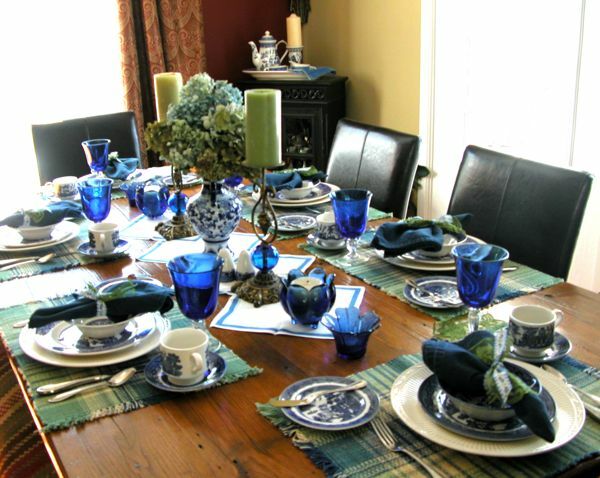 For "Tablescape Thursday" I am bringing it out for St. Patrick's Day. My motto is "use what you have" so I shopped the house and my mom's house for some accessories. Let's get down to business! I love blue and green together. It all started with these placemats I bought at Pier 1 in Alexandria, Va., in the mid-90s. It was Spring and I was just looking around. There were some beautiful displays in the store with these colors and they were calling my name. Now, I am not really a "blue" person, but I thought the combination would be great with the Blue Willow. And, best of all, it is a combination inspired by nature! 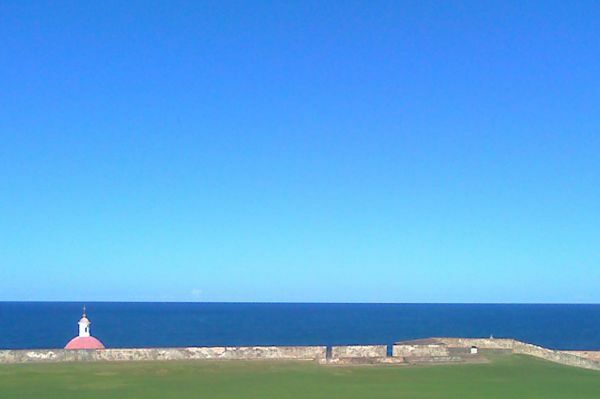 I took this photo in San Juan, Puerto Rico near "El Morro." Is there anything more beautiful than that gorgeous azure sky and ocean next to the green grass? The hydrangeas are from my mother's garden and just bring it all together for me so nicely. I used my Mikasa "Italian Countryside" dinner plates for chargers. This pattern is so versatile, I use it with pretty much anything. I added my great grandmother's Blue Willow plates and bowls made by Royal China. The bread plates are Johnson Brothers, and the coffee cups and saucers are by Churchill. I found this ribbon and lace in a bag of trim my grandmother had and thought it would be perfect with these blue napkins instead of traditional napkin rings. For a runner I brought out the same vintage cocktail napkins I used with the espresso set last week. I just had to use them! These little blue votive holders are all from the late 90s also. I brought out my Churchill coffee pot for after-dinner coffee and paired it with the cream and sugar made by Royal China, and a tray I bought in Japan. There you have the age-old "Blue Willow" for yet another holiday! I think the woven placemats give it a more casual, contemporary flair. This is such a versatile pattern that really just goes with anything and is perfect for any occasion whether casual or more formal. Thank you SO much for stopping by:-) I hope you find something you can take with you to make your house a home. Your comments mean so much to me, and lead me to the wonderful ideas I get from you. Have a lovely St. Patrick's Day! 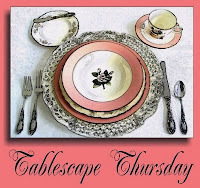 Be sure to go over to see Susan at "Between Naps on the Porch" for fabulous tables and other great ideas! Cream dinnerplates: Mikasa "Italian Countryside"
like that you used your gmother's lace and ribbon for napkin rings- very personal. the plaid does look good with the blue willow- much more laid back. also liked the napkins laid at an angle and overlapping. Hi Anita! Oh, I love your pretty tablescape! Now I love Blue Willow and have a big set of it too. I need that coffee server! :) The blue does look so pretty with green. I really like what you did with the napkins and those hydrangeas - oh my, they're totally beautiful!! Great job, sweet friend and hope it's warming up in your area. Anita, I love blue and green together. 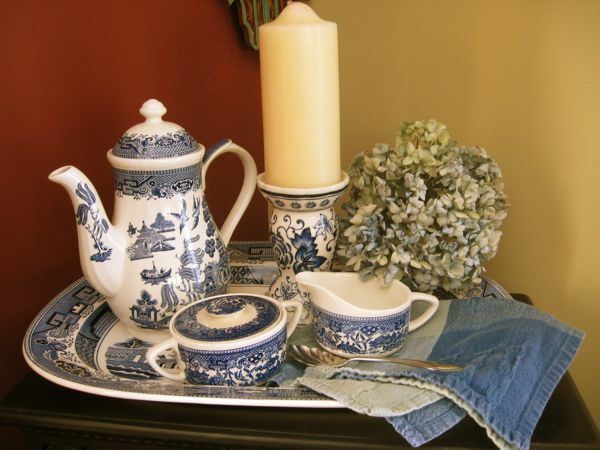 Of course I love the blue and white china. I am always drawn to blue glasses when I am out shopping, but trying to not buy much blue for the house anymore. I use to have a lot of blue. Blue furniture, blue in the kitchen wallpaper, blue glasses and on and on. I love it, Anita! 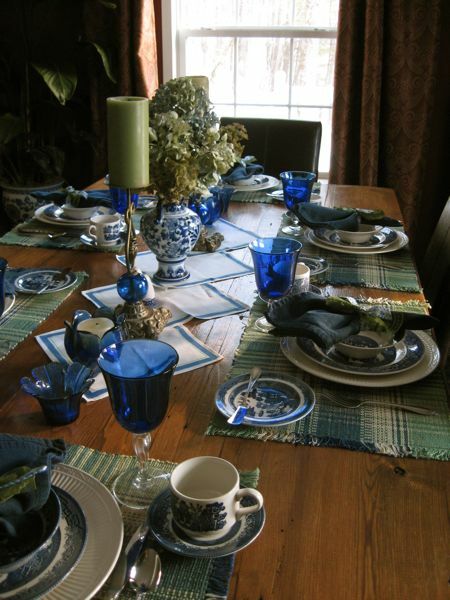 I think this is a great looking tablescape, and I think the blue willow worked well for St. Patrick's day. I like it because it is unexpected, and yet it goes so well with the green. Great job! Anita, your table is absolutley gorgeous! I love blues & greens together. it is my favorite combination. Beautiful table and I love blue and green. Looks so nice! I JUST LOVE THE WAY YOUR TABLE LOOKS SOOO BEAUTIFUL!!!! AHHHH HOW MANY TIMES I HAVE SEEN THE BEAUTIFUL MORROW OF MY LITTLE ISLAND, THANKS FOR SHARING, NOW IM HOME SICK FOR MY TINY ISLAND....LOL!!!! What a striking color combination that isn't seen very often! Beautifully done, Anita & I agree, the natural light really sets off the dishes & glasses. Very, very well done! 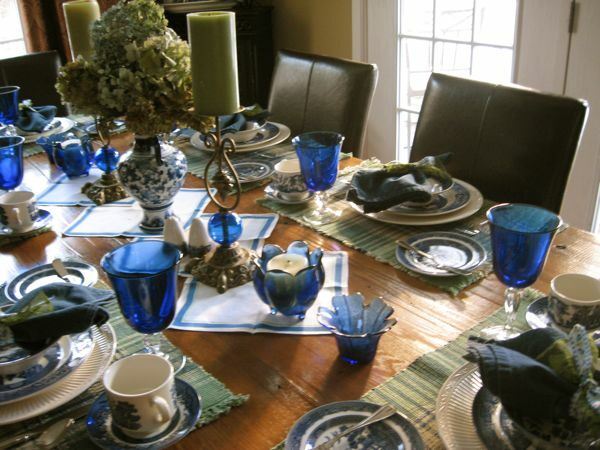 Beautiful table setting, love the combo of blue and green together. I love it! Lovely combo! My collection of blue willow is growing. Our market is selling them as a special every week. Good way to collect a little at a time...and sneak them in with the groceries! 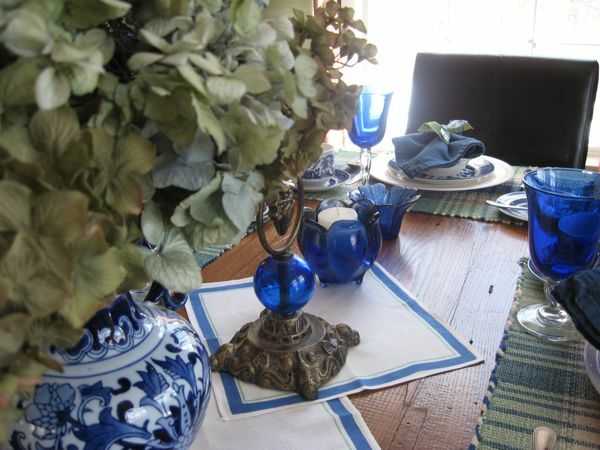 Such a pretty table..Soon the hydrangeas will bloom so we have the fresh gorgeous blues again! Love the placemats. Beautiful! The blue just makes the table to me. It is the star. 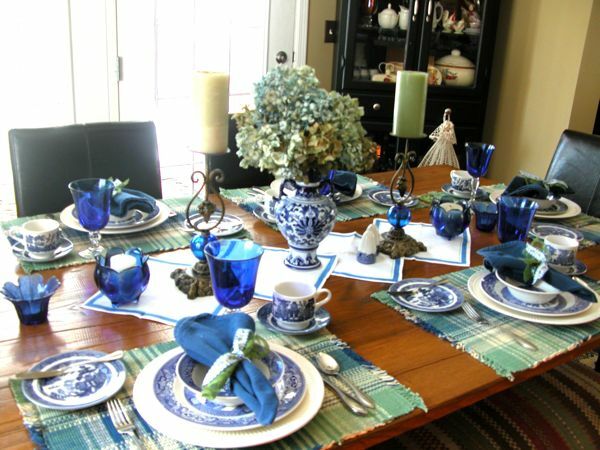 I am such a fan of blue and white and I love your St. Pat's table! I absoulutly love your blue cups and candle holders! Mixed together with the green, makes it perfect! Beautiful tablescape! 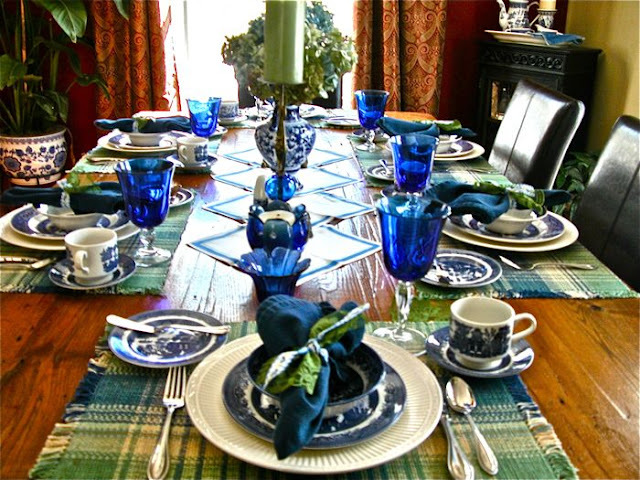 Anita, blue and green are my favorite color combination...your table is one of my favorites. Those napkins are perfect used as a table runner. The candle holders, I just love. I love blue and green together too--it makes me think of ociean water! I adore blue & green together. My family room is done is china blue & apple green. So you know I'm droolng over this table. Those candle sticks are so beautiful. Thanks for sharing. I saved some notes on your blog today so that I could shamelessly copy the ideas! I like the way you created a "runner" out of little napkins. Love your blue willow!!! The table runner is so creative and cute. I like your blues and greens together. 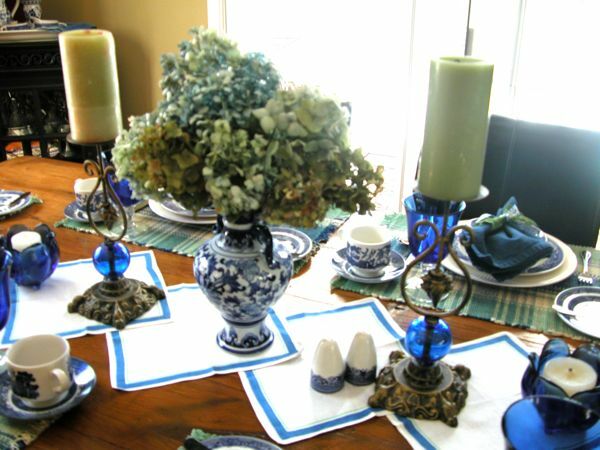 Love the blue candles all around and the hydrangeas. I really love your tablescape - great job! I love the idea of using Blue Willow for St. Patrick's Day! 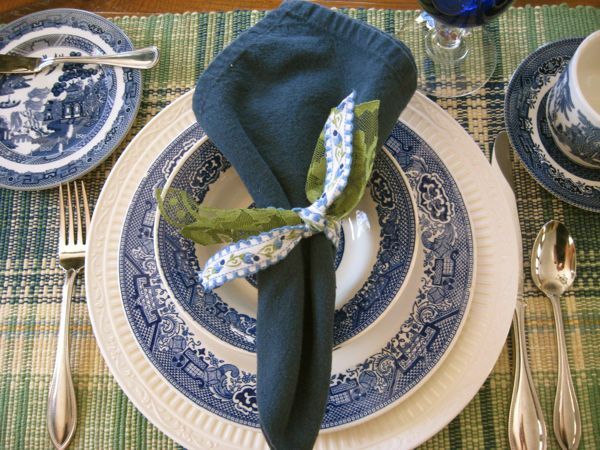 You incorporated the greens beautifully with the placemats and the pretty lace/fabric napkin ties. It looks fresh and original. I agree that the table looks its most beautiful with the natural light streaming in. Nicely done! The blue and green look fabulous together and of course, Blue Willow is such a classic. 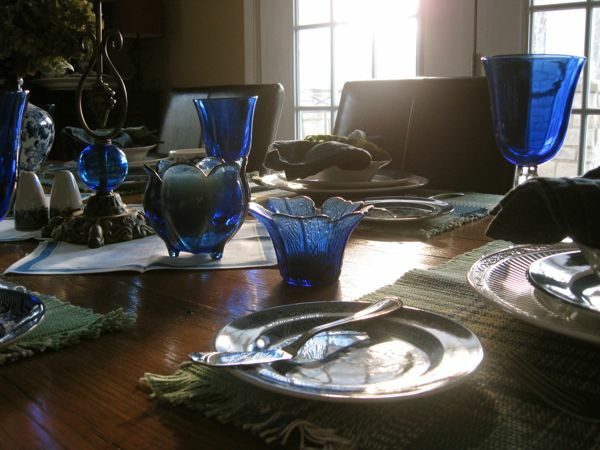 I love the dark blue goblets and the place mats that tie everything together. And I love how everything looks by candlelight! Beautiful! you are the only one i know in blog world. you do both! no fair!!! HELLO ANITA...I GOT A GIFT FOR YOU IN MY BLOG,I MADE A PERSONAL SIGNATURE WITH UR NAME,HOPE U LIKE IT.IT IS IN MY LINKS PAGE,U SCROLL DOWN AND SAVE UR SIGTAG.HUGS. I really,really love that tablescape...just the touch of green is so refreshing and what a wonderful way to do St. Patrick's w/o overdoing it. I didn't do a Tablescape this week, but just visiting a few of my fave tablescape friends. 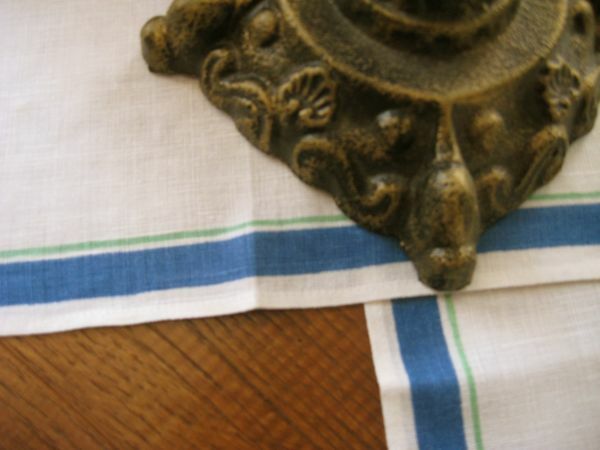 Your blue willow collection is gorgeous! I just bought that same stemware over Christmas (it was one of my presents! :), and love it! I don't do alot of blue either, but it goes w/ my 'other gifts'! Hope ya'll are thawing out up there in the mountains. What a lovely table Anita! The Blue Willow looks very nice with the green. I love Blue Willow and have been slowly collecting it since I was 18. I agree, you can dress it up or down. I used it for our Christmas dinner this year in a formal setting.